← What’s Your True Personal Value? While this post will focus primarily on the days just prior and then following my surgery, it’s worth noting the roller coaster ride of emotions that I felt from the moment the procedure was scheduled in early February to the actual event on March 4, 2016. As mentioned here, I experienced a day to day acknowledgement of the little things we take for granted where both arms & hands are naturally used together. One major question I faced was how to conduct my training in the final weeks leading up to my surgery. Logically I knew a huge change was coming and yet once I got into each workout, the inner drive and passion to train would kick in and I would inevitably perform like nothing out of the ordinary was looming on the horizon. Stranger still were the workouts in the last week where I trained hard up until the final day before my procedure. Logically I could tell myself as I completed each exercise…sets…and reps…that this would be the last time to train in a normal fashion for the next year…and yet the realization that my regular training was over really didn’t kick in until the morning of my procedure. My day started as normal with Bible study which is usually accompanied by coffee mixed with Dymatize Fusion 7, a meal replacement product I use daily. It taste amazing and counts as my first meal of the day before hitting the gym roughly 90 minutes later. The problem was that my doctor said “no food or drink…period” after midnight. For someone who wakes up each day pretty much starving, this is a challenge. Jim Perkins, my first Dad, came in the day before to take me to the hospital and to be with me in the first few days following my surgery. I took an extra long shower to kill time and try to take my mind off of skipping my coffee & protein. As emotionally wound up as I was, it didn’t help and we hit the road shortly after 5AM to be at the hospital by 6AM. 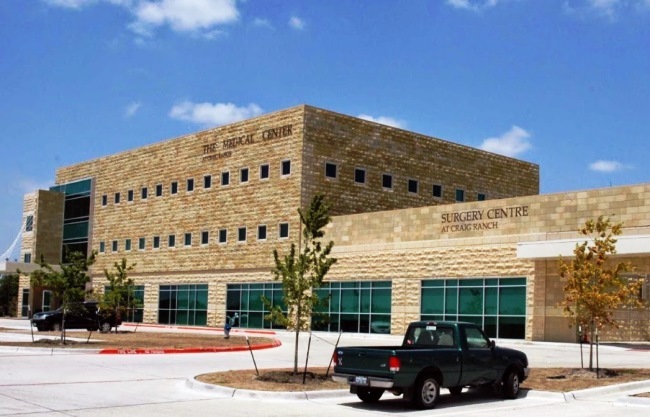 The Surgery Center at Craig Ranch is smaller than your typical hospital and I’ve driven past it countless times in my travels back and forth on the Sam Rayburn Tollway. Not that it would make any difference in the procedure to be done, but the smaller nature of the facility did make me feel a little less intimidated. We were for the record the first ones in the parking lot and were waiting on the staff to open the doors at 6AM sharp. There was a mother and daughter combo checking in ahead of me so the wait was brief. 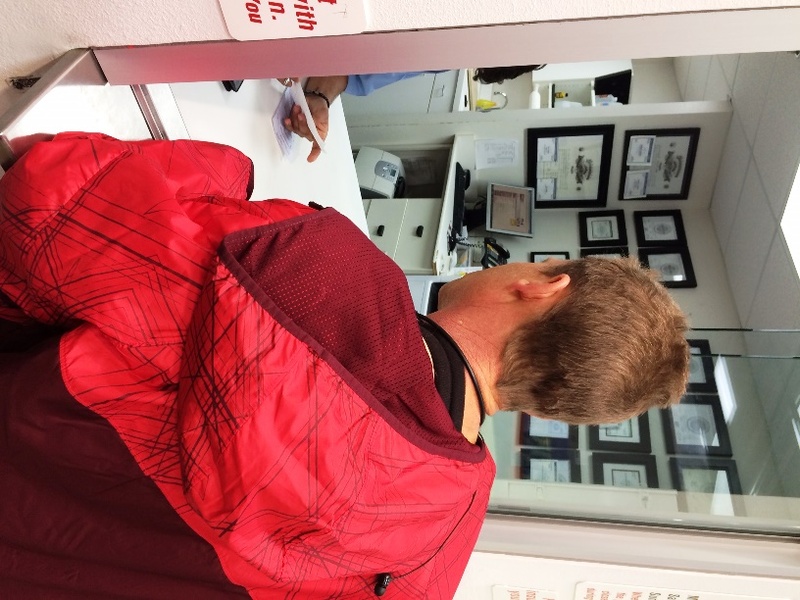 After I filled out my paperwork, Rebecca at the registration desk explained that they would come to get me shortly. I took a moment to call my Mom and Nanny both in East Texas to give my love and express to them not to worry as I expected Dr. Burns to do a great job. Soon after, Rosa, my pre-op nurse took me back to get ready. Rosa was super sweet and took great care of me. After having me sign a handful of documents pertaining to emergency contacts and sharing my vital info…just in case, Rosa helped me get changed in my hospital gown and surgery socks. What a fashion statement! Next came the IV in my hand which hurt quite a bit! I don’t mind regular shots in the least, however a needle in the top of the hand is uncomfortable to say the least. Teresa & Betty, the OR Team, said their brief hellos as the anesthesiologist came in to work his magic. He offered a pain block that would be good for 12-18 hours post surgery. 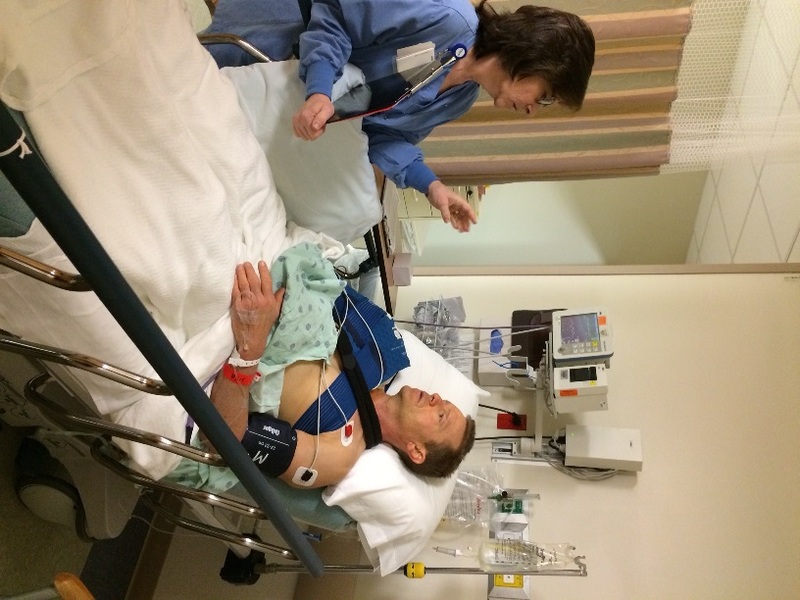 He said most shoulder surgery patients take the block and considering the fact that I was having my bicep reattached as well, he strongly advised that I take the meds. It really wasn’t a question at that point and he said it would require him putting me to sleep before administering the block. And that’s my last memory before Starla woke me in recovery…3 hours later. When I regained consciousness, Starla was there checking my vitals and my Dad was standing at the foot of the bed. He said Dr. Burns shared that the surgery was a total success and that I could go home soon enough. My first thought beyond the relief of the positive news of the outcome of the procedure was that I was starving. Fortunately I came prepared with a big protein drink to have after my surgery. It would not only the satisfy my immediate hunger, but also help with my headache due to missing my morning caffeine as it was a blend of vanilla whey protein & vanilla flavored coffee…YUM! Dr. Burns did come in to check on me and reassured that everything went okay. I had a huge bandage on my right shoulder wrapped in a Breg Polar Care Cube. It’s basically a small electric cooler with a hose that attaches to the wrappings on your shoulder or what ever body part you’re icing. Once filled with ice and water, it circulates the icy brew through the pad providing for some amazing pain relief. I basically wore it night and day the first week outside of taking a shower. After Dr. Burns confirmed my next appointment for the following Monday morning to remove my bandages, it was time to go home. Starla helped me back into the sweat pants and size 2X windbreaker that I brought to wear as it would fit over my bandages. Once dressed she helped me into a wheelchair and took me out to meet Dad just outside the back door. Once safely in the car, it was off to Costco to get my “pain meds”. I wanted to pick up my prescription of Vicodin ASAP to prepare for when my pain block wore off. Unfortunately after trooping all the way back to Costco’s pharmacy, they said that they didn’t stock Vicodin but that they could order it. That wasn’t going to work and we headed for Walgreens. They were able to help me and then it was on to home for a late lunch and getting still to start the healing process. By late afternoon, I still had very little pain thanks to the pain block. It really wasn’t until about midnight that it started to wear off. Fortunately I had my Vicodin ready to go and took it strictly every 4 hours over the first couple of days. Saturday was very low key. I got up at my normal time for my Bible study and then worked on my next newsletter for work to be published the following week. It would be a “special” issue as the only one ever done while under the influence of Vicodin. Dr. Burns called to check on me after lunch and said I could also take 800 mg of Advil every 8 hours in addition to the Vicodin to help with inflammation. Normally I take very little medication so his call prompted a trip to Kroger’s to pick up a few food items for Dad and Advil and extra ice for me. We also picked up a movie from Red Box and headed back home for a quiet evening. As much as I wanted to go to church on Sunday, there was no way with my mega bandage still on my shoulder. I had not taken a shower since early Friday morning before surgery and was under strict orders to not bath until having my bandages removed which would not occur until the next day. Plus, I couldn’t wear normal clothes so church was pretty much out of the question. Thank goodness for Prestonwood’s live online streaming so I was able to watch the service and not miss out completely. It occurred to me while watching the service that while I couldn’t take a shower, there was no reason why I couldn’t wash my hair. Just to be safe, rather than trying to do it myself, I convinced Dad to take me to Sports Clips where I normally get my hair cut. The chairs you sit in provide an amazing massage and the stylist took a little extra time since I was only there to have my hair washed. While I still desperately wanted a shower, it felt really good to have clean hair. Later that morning, we arrived at Dr. Burns office just minutes before my 11AM appointment. It felt so good to remove the bulk of the surgical bandages having them replaced with simple band aides and Steri-strips. Dr. Burns said I could now shower as normal but to always follow with a new round of bandages. While the swelling was pretty “shocking” too me, he said everything looked fine and that he would see me the following Monday to have my stitches removed. After lunch, my Dad hit the road back to his home in Oklahoma. He was a real trooper in taking care of me the first weekend. This included getting up 1-2 times during the night to refresh my ice machine which I was wearing pretty much around the clock. While the circumstances were not the best, it was an unexpected bonding time for us as we’ve not spent that much one on one time in many years. That afternoon, Jeff Amidon (my second Dad) and his wife Louise came to stay for a few days. They were a great help doing a number of things around my apartment that would be a struggle for me just following surgery. Further, I had committed to my boss and company to work diligently from home as best as I could the first week after my surgery and their help really leveraged my efforts. With the Vicodin gone and my dosage of Advil steadily shrinking, my desire to exercise started to go up. Tuesday late afternoon I took a 30 minute walk around my neighborhood. Wednesday morning, while my “company” slept, I slipped out and up to my apartment complex’s little fitness center and put in a 2 mile walk on a treadmill. Wednesday night was hard in terms of sleep and I didn’t feel like walking early Thursday morning. I did get in a late afternoon walk which made me feel great and all the more eager to get back in the gym. After finishing my bible study Friday morning, I was just itching to go to the gym. 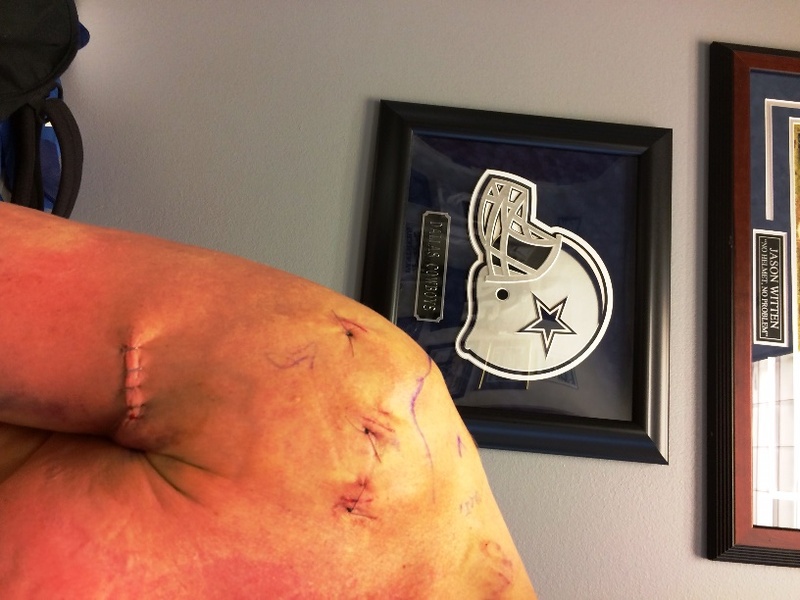 Dr. Burns said I could train as long as I was careful not to stress my shoulder and arm. In my mind, my arm may have been in a sling, but the other 75% of me was still working. So, after a little more consideration, I opted to head to the gym and see what I could do. The next day on my schedule from prior to surgery was shoulders and back. While it might have looked a little strange, I actually had a great workout doing a variety of left armed pulls and presses. Having just changed gyms prior to my surgery, it was nice to train in relative obscurity without having to answer a ton of questions about what happened to my arm. Psychologically it was a big win for me and got me all the more fired up to do legs the next morning. Saturday is my normal day to do legs and one of my primary exercises is Trap Bar Dead Lifts with a built up base to provide for extra range of motion for my quads. This is typically done with both hands. So how would I perform this exercise with one arm in a sling? The answer is Sumo style with my new gym’s robust collection of kettle bells. While an 80 lbs kettle bell is their heaviest, when done with one arm for high reps with a built up base, it gave me a surprisingly positive training effect. I was basically able to perform all the same movements as normal with slight modifications to account for my arm and shoulder. While the physical training was rewarding, the emotional boost was off the charts. Walking out of the gym, I felt almost like the old me and was very encouraged about moving forward with my recovery. After missing church the previous Sunday, there was no way I was going to miss again. Fortunately Prestonwood Baptist is just minutes from home so the drive is easy. The service was great and it felt good to be back in the presence of a body of believers I have grown to love over the past 13 plus years. Of course I was obligated to answer the inevitable question of “what happened to your arm?” but it was expected and all good. Ultimately it was another emotional victory on the road of recovery. Monday morning couldn’t come soon enough as I was eager to have Dr. Burns remove my stitches. Having stitches in my knee a few years ago, I wasn’t so concerned about having them removed as it would be painless. The 5 staples holding the incision where my bicep tendon had been reattached was another story. To say that I was a little intimidated would be an understatement. Fortunately it was not a big deal and it felt great to have them out. Dr. Burns was pleased with my progress and said the next step would be physical therapy. Given the nature of my surgery, he said to expect to go three times weekly for several months. 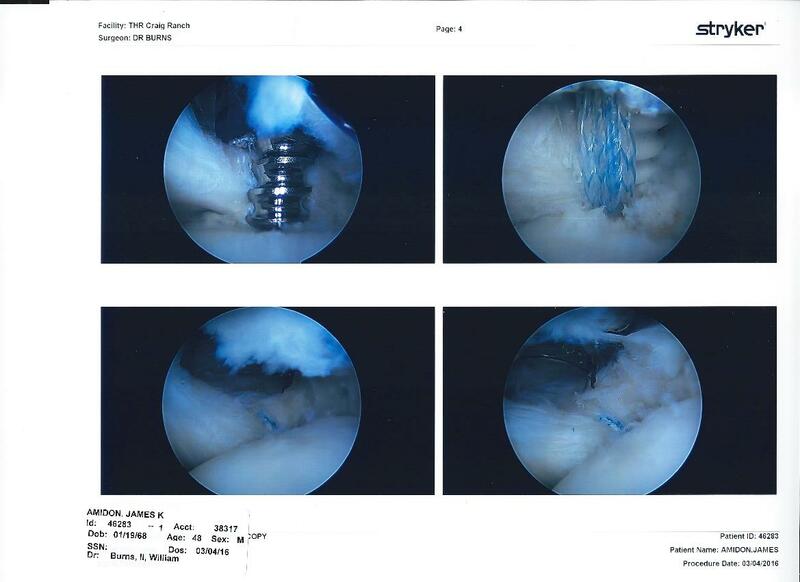 My only prior surgical experience was my knee scope where I regained full strength in approximately 90 days. Dr. Burns said my shoulder and arm would take more like a year to fully recovery. Wow! While encouraged to be on the road to recovery, the timeline for healing would be difficult…and require much patience. This is my base line standard for turning any negative situation into a positive if the only “silver lining” is that I will be better able to help someone else in the future either avoid or better cope with a similar challenge. As of April 2, 2016…at 4 weeks and 1 day post surgery, this verse has helped keep me going however some days have been hard. My biggest lessons so far include a greater perspective and increased gratitude for how blessed I am. There’s nothing quite like losing your right arm and hand when your personal life (recreation and basic survival) and job depend on using both. I will share further in my next post regarding physical therapy, however where I used to count it victory in the gym to add 5 lbs here or another rep there, now simply increasing the range of motion of my right arm in a matter of inches from one day to the next is huge. The quickest road to depression is to focus your energy on where you lack “things” in your life. The quickest road to peace and joy is to count your blessings. For the positive, my situation is nothing more than a temporary inconvenience. Painful…but temporary. I am greatly humbled when I see people confined to wheel chairs or missing an arm or leg. Their situation is light years beyond my momentary affliction and I’ve gained a whole new respect for those with such challenges. My parting wish if for you is to always do your best and make the most of every situation regardless of your limitations or challenges. You can do more than you think you can. Best of luck in your journey…. This entry was posted in attitude, Christian, Follower of Christ, goal setting, life path, Prestonwood Baptist Church, recovery from injury, rotator cuff injury, torn bicep tendon, Uncategorized and tagged #diet #health #fitness #wellness, Faith, Follower of Christ, goal setting, life path, personal development, Prestonwood Baptist Church. Bookmark the permalink.